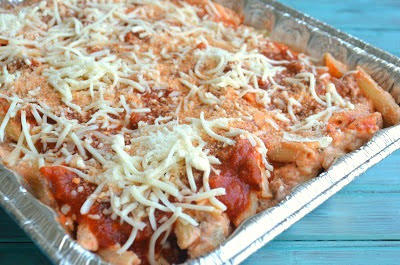 There's really no rhyme or reason to the perfect Baked Ziti dish. There's pasta, there's sauce, and there's cheese. 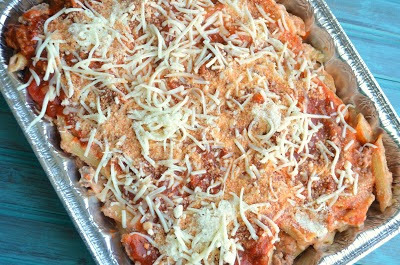 The amounts and proportions are really up to your discretion, so I suggest figuring out what you like (a cheesier ziti, a meatier ziti, a saucier ziti) and amping up that portion of the dish. 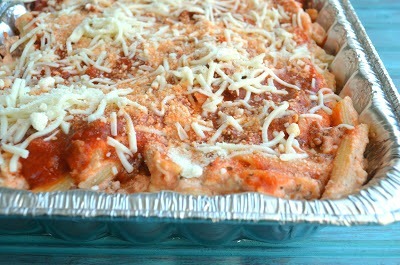 I'm in love with my lasagna recipe, so I used that as a guideline to this recipe. I love meaty and cheesy pasta dishes and that's exactly what this is. There is a good amount of sauce, so it doesn't dry out like some Baked Ziti dishes tend to do. It also gets creamy from the Ricotta and hefty amounts of Mozzarella and Parmesan cheeses. I decided to freeze this batch so we could eat it at a later time (which is why the pictures are pre-baked). All I'll need to do is let it thaw and then bake it for 30 minutes. Enjoy! In a large skillet, add the ground beef and pork. Cook until brown, adding garlic halfway through. Drain off fat and add back to the skillet. Add sauce and cook until heated through. Set aside. In a separate large bowl, mix together the Ricotta, egg, salt, pepper, Italian seasoning, 2 cups Mozzarella and 1/2 cup Parmesan cheese. Stir to combine. Spread two spoonfuls of the sauce mixture onto the bottom of a 9x13” pan to prevent sticking. Add the pasta to the Ricotta mixture and mix well. Reserve a cup of meat sauce. Pour the remaining meat sauce into the Ricotta and pasta mixture and stir to combine. Pour mixture into the pan. Spread the reserved cup of meat sauce over top of the pasta. Sprinkle the rest of the Mozzarella and Parmesan cheeses over top. If freezing, cover tightly with aluminum foil. Thaw in the refrigerator before cooking. If cooking immediately, cover with aluminum foil and cook for about 20 minutes. Remove foil and continue to cook for 10 minutes or until bubbly. Do you reserve some of the meat sauce when adding it to the ground beef and pork to add later to the Ricotta and pasta mixture?